Electricity prices can vary dramatically within a single day. However, most analyses of energy efficiency programmes ignore this variation, focusing on total energy savings without regard to when those savings occur. 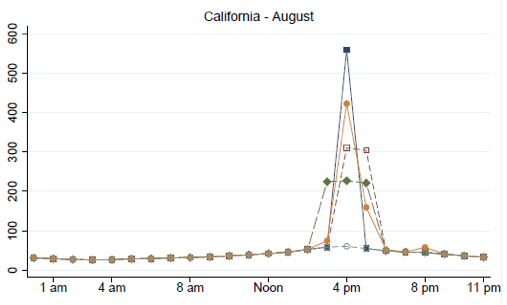 This column uses hourly smart-meter data to demonstrates a surprisingly large variation in economic value across energy efficiency investments. Air conditioner investments, for example, deliver savings when the value of electricity is high, increasing their value by about 50%. Does daylight saving time save electricity? Notes: Figure plots estimated coefficients and 95th percentile confidence intervals from 48 least-squares regressions. For each regression, the dependent variable is average electricity consumption during the hour of the day, indicated on the horizontal axis. All regressions are estimated with household-by-week observations and control for week of sample, by climate zone, and household by month-of-year fixed effects. The sample for all regressions includes all households who installed a new air conditioner between 2012 and 2015, and all summer- or non-summer months, as indicated. Standard errors are clustered by nine-digit zip code. 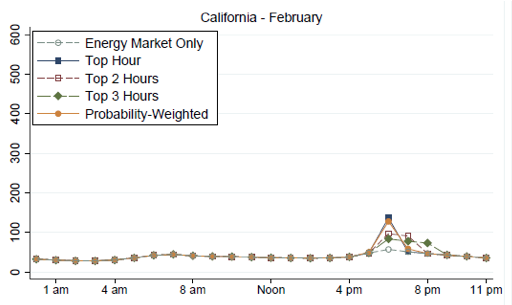 Notes: Figure shows the average hourly value of electricity in February and August in California, under different assumptions of capacity values. The vertical axis shows dollars per megawatt-hour. 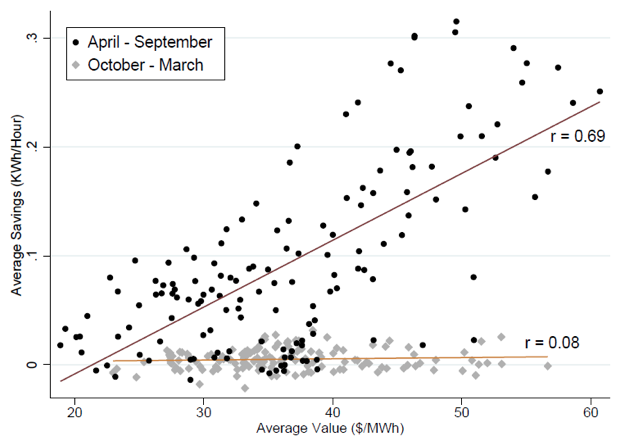 Notes: Scatterplot shows the correlation between electricity savings and California wholesale electricity prices. Each observation is an hour-of-day by month-of-year pair (for example, 1pm to 2pm during November). 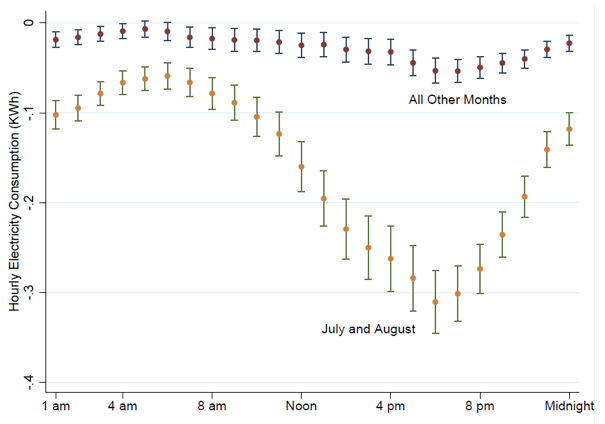 Electricity savings are estimated using a regression which controls for household by hour-of-day by month-of-year and week-of-sample by climate zone fixed effects. The figure also includes least-squares fitted lines for April-September and October-March observations, with the correlation indicated in text above. Borenstein, S (2000), “Understanding Competitive Pricing and Market Power in Wholesale Electricity Markets'', Electricity Journal, July, pp. 49‐57. (2005), “A Primer on Electricity and the Economics of Deregulation,'' in J Griffin and S Puller (eds), Electricity Deregulation: Choices and Challenges, Chicago: University of Chicago Press, pp. 1‐11.